Summer 2016 Recipe: Homemade Melon and Pepper Salsa – Design Your Lifestyle. July 2016 July 2016 Peter Salerno, Inc.
Let’s be honest – not everyone loves “flaming hot” salsa. Sometimes, a fresh, homemade salsa with a blend of sweet and savory flavors is the perfect way to liven up your summer dining table – and we’re here to help! Direct from the kitchen of Anthony and Eve Salerno comes this wildly popular homemade salsa recipe. Like most families, some of the Salernos aren’t able to eat overly spicy foods, so Anthony & Eve developed this fantastic recipe which blends traditional salsa flavors like bell peppers, onions and cilantro with interesting, fresh twists like white beans, black beans and fresh watermelon. The result is a fresh, homemade salsa that everyone is sure to love, with just the right blend of sweet and tangy. Enjoy our homemade salsa recipe with corn chips, tortilla chips, toasted Italian bread or as a garnish over chicken or salmon. Want a fresh take on a summer classic? Try our melon & pepper salsa recipe! * Dice peppers and onion and place finished, diced vegetables into a large serving bowl. * Chop fresh cilantro finely and add to bowl with diced tomatoes, white and black beans, sweet corn, crushed garlic. * Dice watermelon based on your personal taste. Personally, we prefer small chunks no bigger than the pieces of diced pepper. 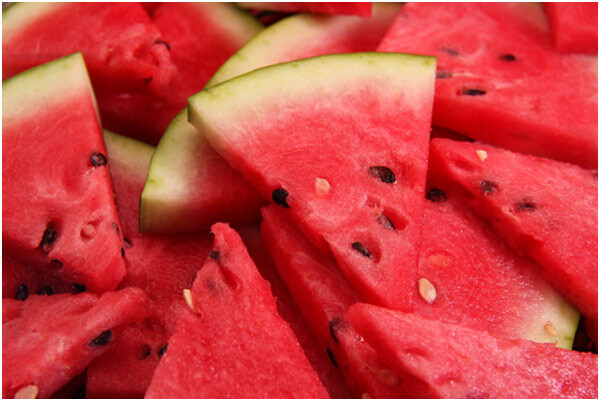 Add as much watermelon as you’d like; again, personally, we prefer an equal watermelon-to-pepper ratio. * Add olive oil, a dash of brown sugar, roasted garlic rice vinegar to bowl. Stir until ingredients are well-coated.